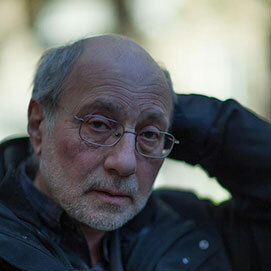 Mikhail Aizenberg is a poet and essayist born in 1948 in Moscow. He graduated from the Moscow Institute of Architecture and worked as an architect and restorer. His works have been published in Russia since 1989, since 1970s he has been publishing abroad. Mikhail Aizenberg is an author of ten books of poetry and four books of essays. He worked as an instructor at the School for Contemporary Art, Russian State University for the Humanities. He supervised the Project O.G.I. poetry book series – one of the main projects of poetry publishing in 1990–2000. He won the Andrey Bely Prize (2003) and was awarded to the literary prizes of Znamya, Strelets, and Novy Mir magazines. Lives and works in Moscow. The austere poetic means of Aizenberg's verse (following the style of Vladislav Khodasevich) echoes a stoic lyric temperament in the face of the restrictive cultural environment of the late Soviet period. Aizenberg's articles on the key figures of Russian poetry in the second half of the Twentieth Century (Joseph Brodsky, Vsevolod Nekrasov, and Evgeniy Haritonov) are remarkable for the precision of their analysis and the breadth of their cultural understanding. Time Machine. Roman Diary essay was published in Znamya magazine 2009. №4, Mistakes in the Travel Guide by M. Aizenberg (2013), and Rome Coincided with Our Perception of Rome (edit. by Claudia Scandura, 2010).